With the first couple of days back to school closing in, the kids are thinking about all things school related. From the supreme collection of school supplies to the perfect backpack, everything needs to be ready to go. While the parent can help the kids before they leave for the bus, what happens when they are school? What can you do to make them smile during the day? 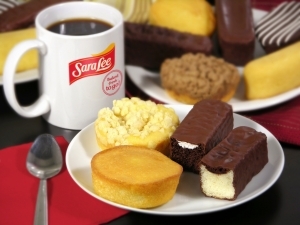 A Sara Lee Snack Cake in their lunch box can make any day special. Sara Lee Snack Cakes are sweet treats that both kids and parents will like. The conveniently single serving packages are perfect for school lunches. Plus, the size and calorie counts don't overwhelm. Kids love the snack cakes because there are so many flavors that they love. From chocolate to creamy centers, there is a flavor for every day of the week. Devil's Food Creme Cake: Scrumptious Devil's Food Cake topped with a heavenly layer of creme, surrounded by a rich, chocolatey coating. Golden Fudge Cakes: Moist golden cake, topped with mouth-watering fudged all withing a delicious chocolaty shell. Chocolate Creme Cupcakes: Divine chocolate cake, filled with sweet creme inced with a delectable chocolate top and a white drizzle. Golden Creme Cakes: Simply irresistible golden cake, complimented with just the right touch of creme. Crumb Cakes: Moist golden cake covered with a sweet crumb topping. Cheese Topped Crumb Cakes: Silky golden cake topped with a ribbon of rich cheese and sprinkled with a sweet crumb topping. Would your kids smile with a Sara Lee Snack Cake in their lunch box? Use the Rafflecopter to enter the Sara Lee Snack Cake giveaway . Disclosure: The sponsor is providing the prize. I received some snack cakes to sample. All opinions are my own. The chocolate creme cakes sounds wonderful! Yum! I'm most excited to try the Cheese Topped Crumb Cakes. I love crumb cakes and cheesecake, so it sounds great to me. I am excited to try the Chocolate Creme Cupcakes! Looks so yummy! I'm excited to try the Crumb Cakes! I am excited to try Chocolate Creme cupcakes. The Golden Fudge Cakes sounds like it would be delicious! I want to try Cheese Topped Crumb Cakes. crumb cakes for me. thanks! I cant wait to try the crumb cake and the fudge cake. I want to try the Buttery Sunshine Cakes. I want to try the Crumb cakes. Mmmm-golden fudge cake. Im sorry but anything with fudge in the title is begging to be eaten. I can't wait to try the devils food creme cake. I want to try the Golden Fudge Cakes. I am excited to try the golden fudge cakes. I love fudge! I would really like to try the Crumb Cake. The person before me took what I wanted so I'll go with my second choice: chocolate creme cupcakes. I am most excited to try the Sara Lee Devil's Food Creme Cake. I want to try the Chocolate Creme Cupcakes. I am psyched to try the Buttery Sunshine cakes! I have tried a couple of these and really liked the chocolate creme cupcakes, so did the grandkids! I'm excited to try the Devil's Food Creme Cakes! I would love to try the golden fudge cake. I would love to try the Cheese Topped Crumb Cakes. I can't wait to try the Chocolate Creme Cupcakes! I can't wait to try the Chocolate Creme Cupcakes. The chocolate creme cupcakes sound good. I would like to try the sunshine cakes. I want to try the Cheese Topped Crumb Cakes first. I would like to try the Chocolate Creme Cupcakes.